Hello everyone, its the Radders here after my camping extravaganza! Well what can I say, it was a triumph, it is the only way to live in my humble opinion. I dont understand why the Momma and the Poppa bother living in a big brick kennel filled with knick knackS and accoutrements. There wasnt a candle holder or a glass vase in sight and yet they seemed perfectly at ease without them, the momma was well chilled out. Sleeping with the Momma and the Poppa on the most comfortable bed in the world in the cosiest canvas kennel. "Belinda was "right "Heaven is a place on Earth!!!" Anyway, whatever, whilst I chilled out with my chew , I was very happy to sit back and watch people busily erecting their kennels with bits of rope, metal pegs and sheets of canvas. Everyone that is except the Momma! With my Sherlock like observations I came to one emphatic conclusion : Momma is the chuck wagon indoors and Poppa is the chuck wagon outdoors! I must say Poppa seemed to be in his element tho and we all relished his culinary fayre. In direct correlation to Poppa's industriousness, was the Mommas lack of any activity whatsoever, nada, nichts, rien! She also appeared to be in her element. I was also in my element, snuggling with my pack, life just doesnt get better than this. P.S Now I know you are wondering about the promised FOOTBALL arent you? Well, the truth of the matter is that Momma didnt buy me a football, she bought me a WUSS-BALL!!! So, feigning puppy like exuberance, I had to dispose of it before it even reached the campsite. If ever a dog can look embarassed then this is it! Still nothing is ever perfect but this camping lark came very close to it. I have learnt a new word. Verklempt - it is of Yiddish origin and means extreme emotion or being on the verge of tears. However, I have learnt today that it is colloquially used in the US a lot. It is used to describe drama queen displays or over dramatic/ theatrical behaviour which is out of proportion with the reality of the situation. According to the Hubster I verklemp quite well on occasions, if only I looked like the above whilst doing it, I could easily justify it. Today I am in semi-verklempting mode. It is Friday and I have done it again! We are going camping, no not glamping, the proper rough and ready variety with a dodgy camp stove, blue plastic mugs, a huddled position over the pan of sausages and a cricked neck in the morning. Lovely, it will rain, which will of course lay myself bare for a verklempt moment or two. Post camping report imminent. If ever I make it back to civilisation and all that I once knew and held so dear .....and ......and.............and!! Big doggy wags one and all, its me "The Radish". Thought it was high time I got my paws on here and raised the standard again. So whats happening Chez T-J then? Well there is much chatter from the Momma and the Poppa about taking me "camping" this weekend. I have no idea what this is but I am remaining most upbeat by the prospects of a good time. I reached this conclusion purely on the basis that Poppa mentioned he'd be getting sausages for the trip and Momma said she would be getting me a football! Alleluiah, she has finally got the message, YES I WOULD LOVE A FOOTBALL!!!. Momma took me up to the Rutland Water dog walk on Saturday and I seized the opportunity to make my feelings known. I turned up the bounding enthusiasm to the max everytime I saw kiddies enjoying a kick about. Ok yeah, I probably over did it but Carpe Diem and all that! Ball games and sausages? Well on that basis I'd say this "camping" has potential. I love my walks up at Rutland Water, I go most days with my muckers, Dyl Bob and Dusty-D and we meet loads of mates, plenty of chummy bum sniffs, tail wags and chasing around. "Radders, Rutland Water, its just like being at the seaside isnt it?" What is she on about "like the seaside"? I mean I am only 1yr old but even I can see that it IS the seaside, just look at it, boats, beach, water! Obviously the seaside! The Momma even said that on Wednesday we would be stopping for ice-cream too so I tell you what more proof do we need to establish that we are at Rutland Water Seaside? I have learnt that she clearly isnt the sharpest knife in the box but my Momma is a top chuck wagon and gives me the bestest kisses and cuddles. ...............and she is getting me a football and I am pretty happy about that! He came home then........Bloggers Block! I started this post a while ago and got stuck..............emotionally stuck. "Sparky is home with us again albeit in a large plastic tub with just his name on it. However, his soul is everywhere, on the wisp of every breeze, on the tip of many a spoken word and forever in memory"
Then I stopped in tears and Bloggers Block set in. The days since have been quite full and so every excuse to say, no time to blog bla bla bla! I tried to do other posts but they just didnt gel, I didnt delete this one though. Deep down I knew I would finish it, when I was ready. I just havent been able to open the tub and re-unite Sparks with Lucy under the Lavatera in the garden. I hope Lucy doesnt mind but just not ready to let go. Human emotions, so complex arent they? Then I began to think about all the fur-babies we have belonged to. Our very first rescue dog as a newly engaged couple, 1995. Rescued from the RSPCA at Radcliffe Upon Trent, this Lurcher (Collie/Whippet cross) NEVER put a paw wrong in all his time with us. Forlorn, matted and hardly any fur on his body, he sat still in the pen and pleaded with his beautiful brown eyes to give him a chance. His beautiful soul captivated our hearts and Whiskey was ours. We were rewarded a thousand times, the most affectionate, fun loving boy who developed the most beautiful coat and fabulous foxy ears! He is buried under a cherry tree on the Brecon Beacons where he loved to romp and forage. Sammie " THE BIG FELLA CHAMP"
"Greyhounds make great pets, give a retired greyhound a home" I was swayed by the huge PR campaign by the Greyhound Trust in 1997 to re-home Sammie. Sammie was a Champion Ex-Racer, when he arrived at the house, we were both open-jawed, he was huge and strutted into the house with all the attitude of a hard-knock teenager. He went straight up to our cheese plant in the front room and cocked his leg and left his mark. However, he didnt fool us for long. The hard exterior gave way to the softest centre, doesnt it always? I have so many tales to tell about Sammie Big Fella, note to self to dedicate a blog to the boy. He was an incredible dog, he had presence, charisma, an air of authority, a gentle strength and I always felt totally protected, he definitley owned me. Suffice to say, Sammie brought me through some of the darkest days of my life, he slept with his head on my pillow and wherever I went he came with me, without complaint, just acceptance that this was how we had to live. Even when that living involved a damp, cold caravan in the middle of a field. For a time, HE was the reason I got out from underneath the duvet and as such, he is eternally loved. He only let me go when he knew I was happy again. Reunited with Gareth, he said "Mum my job is done, I'm tired now"
We thought Sammie might enjoy some greyhound company, the trainer who brought Sammie to us arrived one day with Casey. An elegant, diminutive blue brindle girl. Stunningly beautiful and oh did she know it! "Just treat me like the Precious Princess that I am"
The total opposite to Sammie. She didnt strut, she sashayed. She looked down on Sammie like some ruffian low life and treated his attempts at play with total indifference and distain. Notice how her right paw is elegantly crossed over her left! 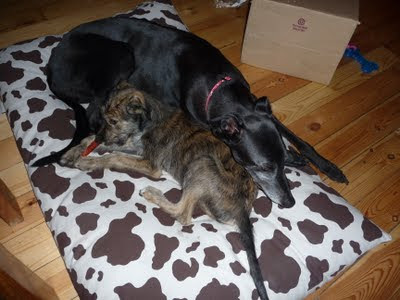 It wasnt a match made in heaven and in the end, distraught yet defeated she was rehomed. BUT we made sure our Princess had the best of homes, a home she wanted. Well it turned out our Diva girl should have won an oscar for her acting ability, aloof, high maintenace was out and playful puppy was in! She was rehomed with a family with 3 young girls, the little minx was now one of the girls and played and played like a puppy with those children. Something we could never give her, but like all of them and like indelible ink, she left her mark on our hearts and lived out her days enriching the childhoods of 3 very lucky girls and Mummy visited her to the end. We only wanted one. We came home with two. 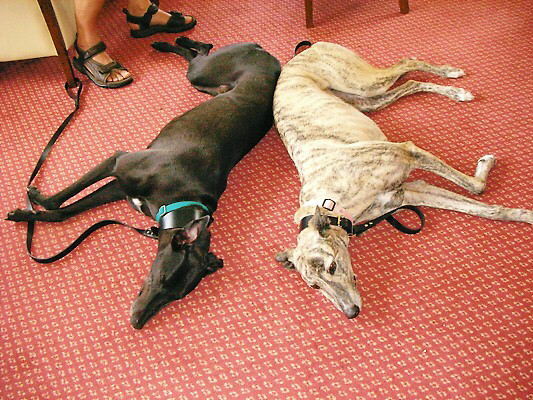 Kennelled together at Northants Greyhound Rescue, we just couldnt split them up. Lucy was a champion hurdler called Moonlighting professionally. 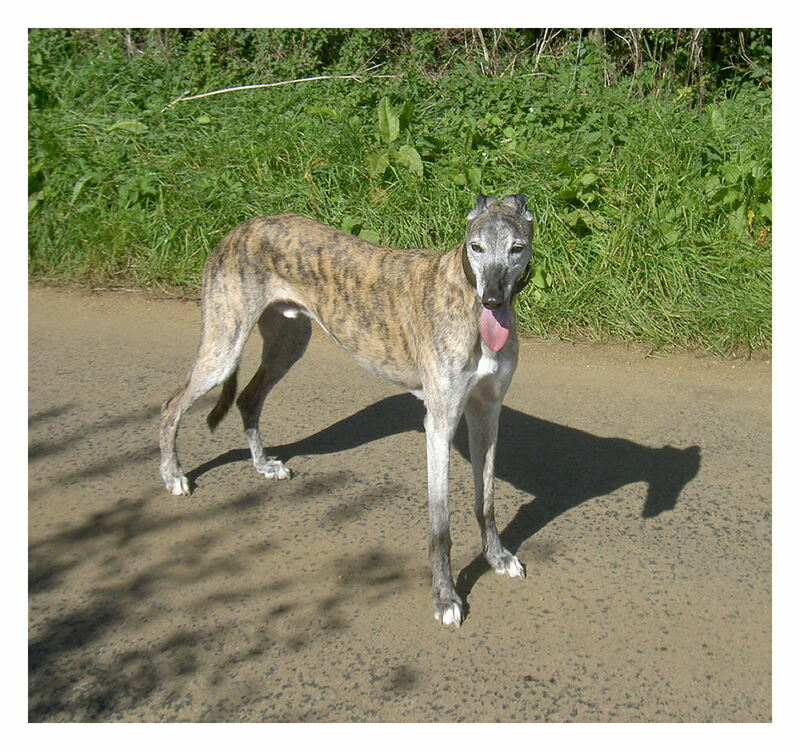 An elegant fawn brindle and so gentle and all for the quiet life. Oh but she loved her bit of rough, her Sparky boy and kept him in line, like any good wife he got a good barking at on a regular basis. Sparky really wasnt very bright. 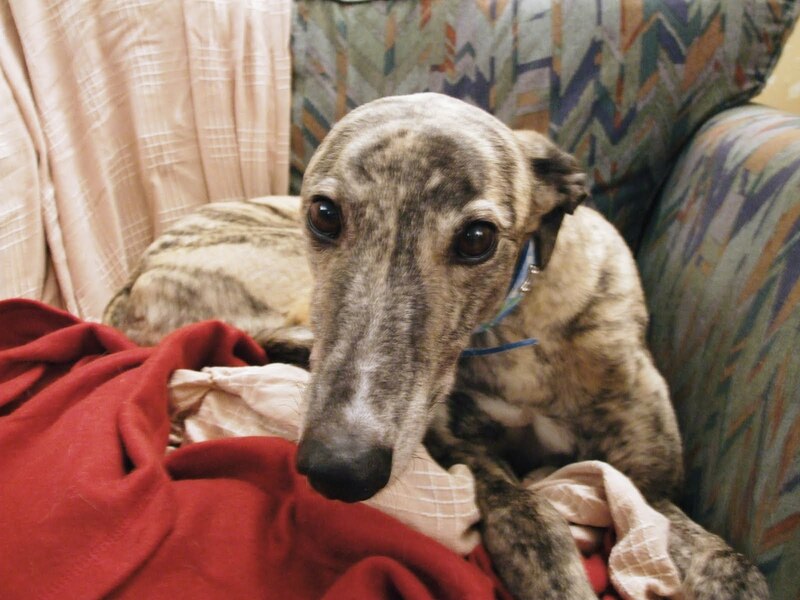 He was a failed racer and ended up living with a homeless person on the streets. But what he lacked in brains he more than made up for in BOUNCE and bundles of enthusiasm for life. There was never a dull moment with a Sparky in your life and he made us laugh till our belly's ached. Lucy was only with us for 3 years but she was so loved and she cherished our love, that I know, I defy anyone not to have loved Lucy, wasnt there a TV show called I love Lucy? Well it was impossible not to, she was just simply smashing. Gentle in spirit but fragile in health she left us on 12th January 2010. Sparky missed the "Wife" so much. He moped and it soon became clear to us that he enjoyed the company of other dogs and being a loner wasnt for him. We tried our best to take her place but no-one could. Lets get a PUPPY!!! Having always rescued our dogs we had never had that experience. We set our heart on Blue. 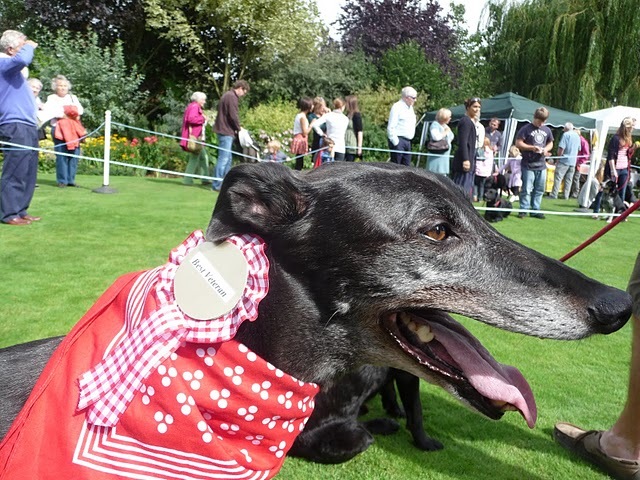 Blue was a beautiful blue lurcher inside and out. After our holiday we were very excited about picking our boy up and bringing him home to Sparky. It wasnt to be. We came home from that holiday in sad times. My Father had died and Blue was bravely battling but losing his fight to meningitis. He did his very best but at just 14 weeks old, his little immune system just wasnt strong enough. He died on the day of my Father's funeral, 20th September 2010. My Father, a life long dog lover, needed Blue more than we did, its the only way we could make any sense of it. But just like the rest, the longevity of his life was immaterial, our little boy Blue will never be forgotten, he was still ours. Radish's introduction to our home was a fraught and frightening time! 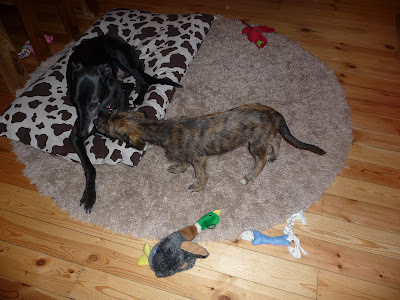 We couldnt bear to lose another puppy but here we were AGAIN with a desperately ill fur-baby on our hands. A deadly parasite. The vet said, we will give him the meds but its really down to him to fight. And fight he did, 2 whole months he pushed on through, I dont want to go anywhere he was saying, I want to be with you. Sparky came into his own, not so dim afterall. He nurtured that puppy like any good big brother would do, he loved that puppy and he protected him. No money could buy a better mentor, role model or trainer for a puppy than our Sparks and under his watch, our Radish grew stronger and stronger. Then came the day when Sparky's own health began to fail, we knew we were on borrowed time and once again we knew we were heading down that painful path once more. He would have the best of his halycon days, we would make sure of that. 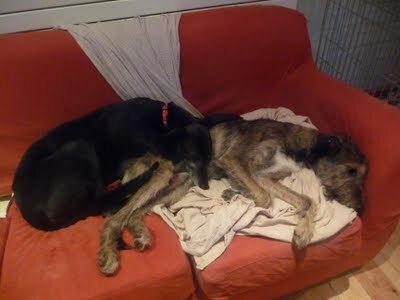 Soon came the day when it was puppy's turn to return some canine comfort and provided a soft cushion for some old bones. 21st June 2011, the longest day, we lost our Sparky boy. This post started with him and so it is fitting that it should end with him. Our Sparky, an all round WINNER.